"This salad is irresistible - colorful and delicious! You must keep it under a press overnight (or for 24 hours) and then in the fridge for best results. It tastes much better if you keep it in the fridge for a couple of days before eating." 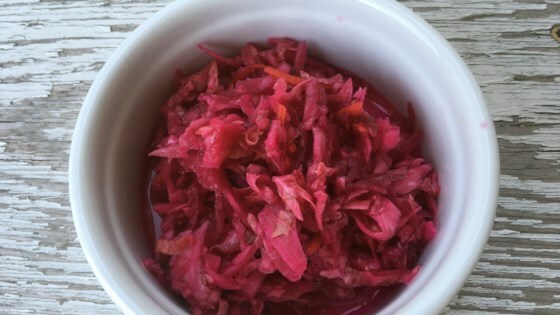 Combine cabbage, carrots, beet, and garlic in a large glass bowl. Stir together water, sugar, salt, and pepper in a large saucepan over medium heat and bring to a boil. Stir in vinegar and oil and heat for 30 seconds, but do not boil anymore. Pour hot brine over vegetables and stir to combine. Place a plate on top of the vegetables and weigh down with a bowl of water or a full can of beans. Press at room temperature, 8 hours to overnight. Transfer salad into 8 pint-size jars, seal, and store in the refrigerator. Watch how to make this traditional Ukrainian beet salad. I often make a ginger variation for my husband (he's a big fan). I grate some fresh ginger into each jar in step 4. It gives it a very interesting, aromatic flavor. Absolutely wonderful !!!!! Great recipe; easy to follow and delicious results. There is a deli nearby that sells this; but I liked it so much....I am glad to have made it myself. Needs to sit for a few days in the fridge.